Do you like rice? I do. In fact I eat too much that my every new year’s resolution of getting rid of that rice belly never seems to be possible. 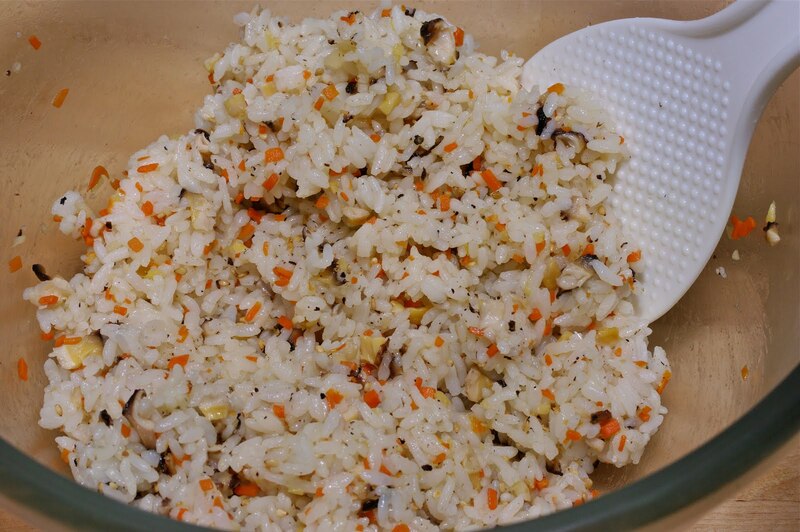 Do you have lots of leftover rice in your fridge and you are thinking of getting rid of them? My mother used to say when I was a kid that each grain of rice is like each drop of farmer’s sweat. They put their souls to harvest those precious grain and if you waste any, you are disgracing their job. So, eat your rice, every single grain, to support our farmers. My rice belly is a living proof of my support, and it is all natural! I will show you how to redeem those leftover rice to another level. Two different kind of rice balls! Everyone needs second chance, don’t we all? These are what I found in my kitchen. Bacon, Shitaki mushroom, green onion, carrot, ginger, garlic. Be creative! You can use whatever in your fridge that appeals you. Of course you will need rice. It has to be short grain rice. Either Korean or Japanese. The fluffy long grain rice is not going to work here. You will need mushroom, carrot, garlic, and ginger. Chop them as fine as you can. because they will get shrunken when cooked. 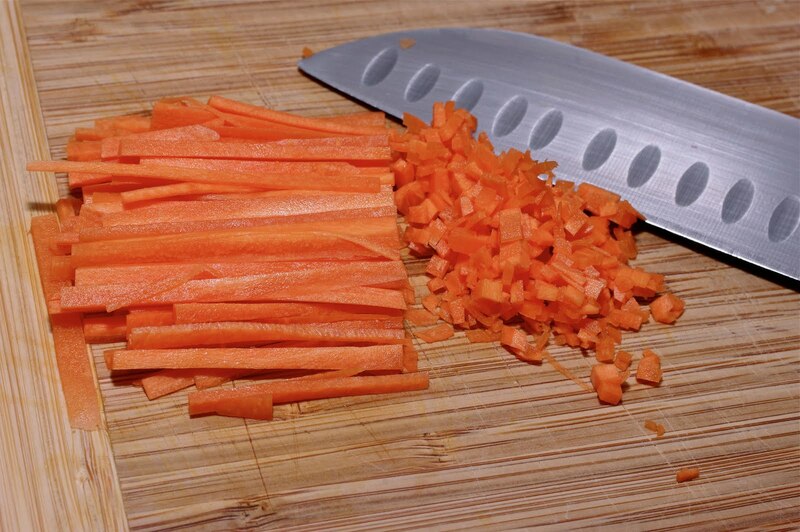 Wondering how you can chop the carrots so fine? 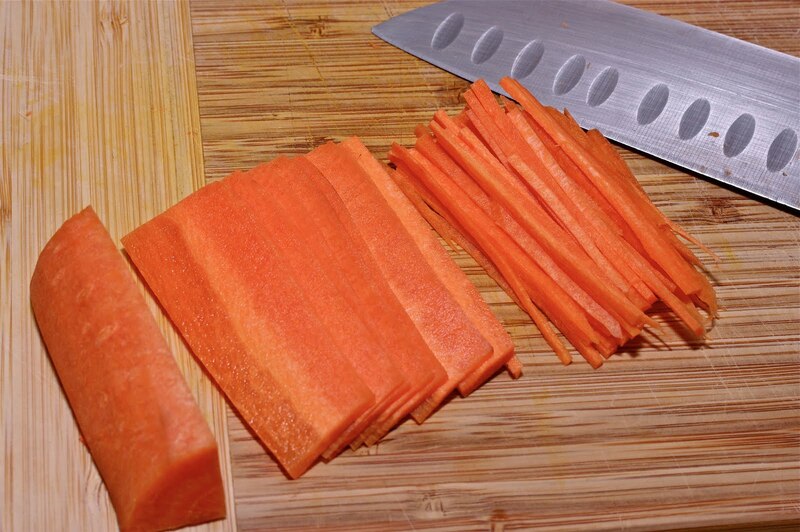 Slice carrot thinly first and cut them into sticks. 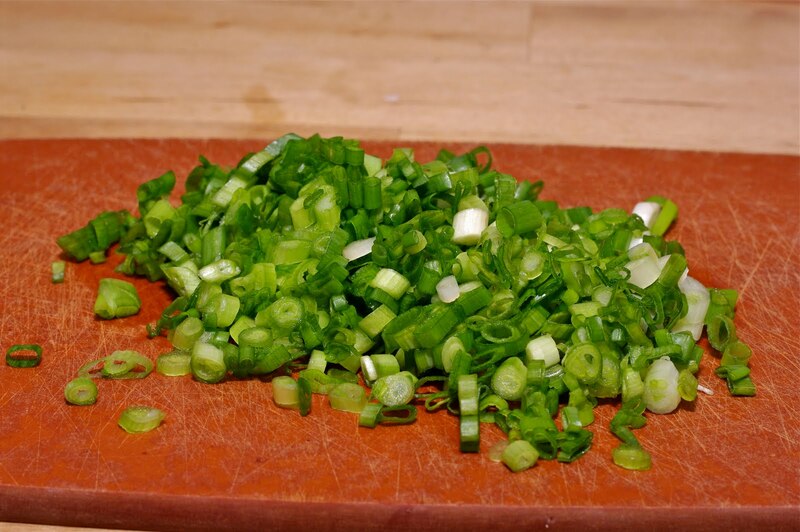 Then cut those sticks finely to make tiny pieces. Can those pictures do the justice? Heat a little oil in the pan. Saute them until they are slightly tender. 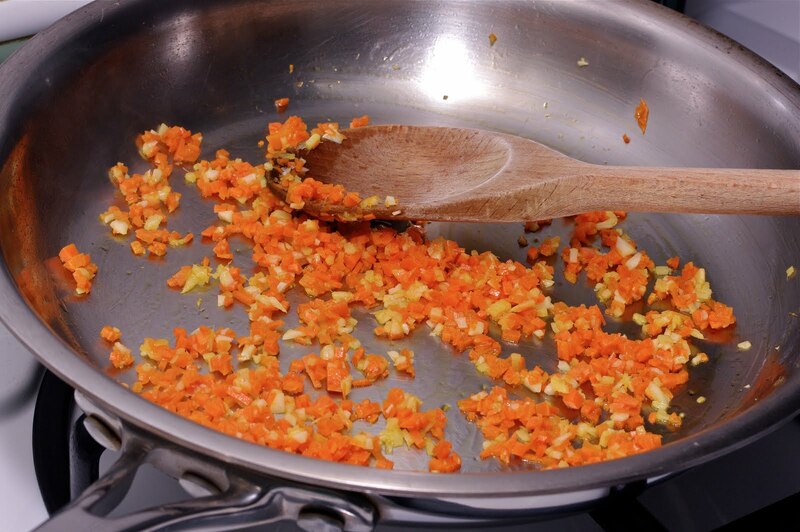 You may add a little chicken stock(1Tbsp) to soften the carrot. The liquid will evaporate soon. Add mushrooms and cook until they are done. Combine mushroom mixture, sesame seeds, sesame oil in a mixing bowl. Get disposable gloves. If you don’t have one, invest a little $ here. They are quite handy in the kitchen. Spread your gloves with a tiny bit of oil to prevent from sticking. Make into balls (about size of golf ball) with those rice. Pop one ball in your mouth and start dancing! Now you will proceed to make rice bowls #2. 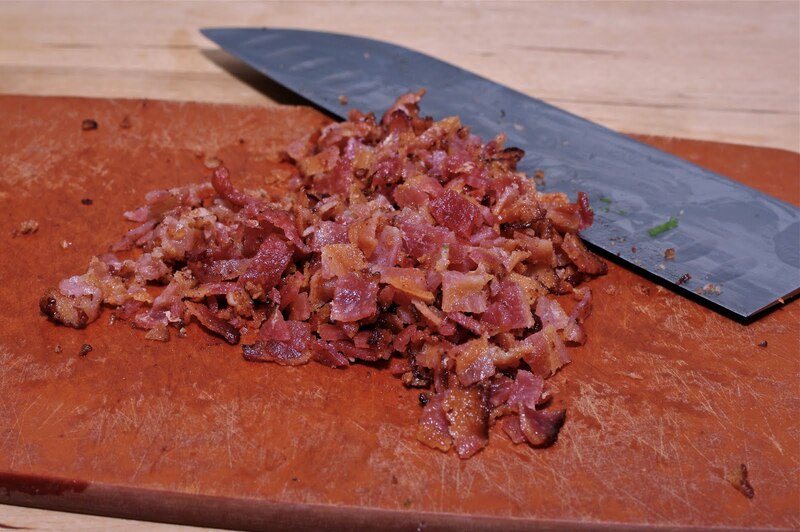 Chop the bacon into small chunks. Wilt them in the pan over medium heat with a tiny bit of bacon grease. You only need to cook them for 5 seconds. Combine mixture in a bowl. I added black sesame seeds (optional). Taste to check if they are well seasoned. Drizzle a tiny bit of sesame oil for a flavor if you wish. I like the size of golf ball. 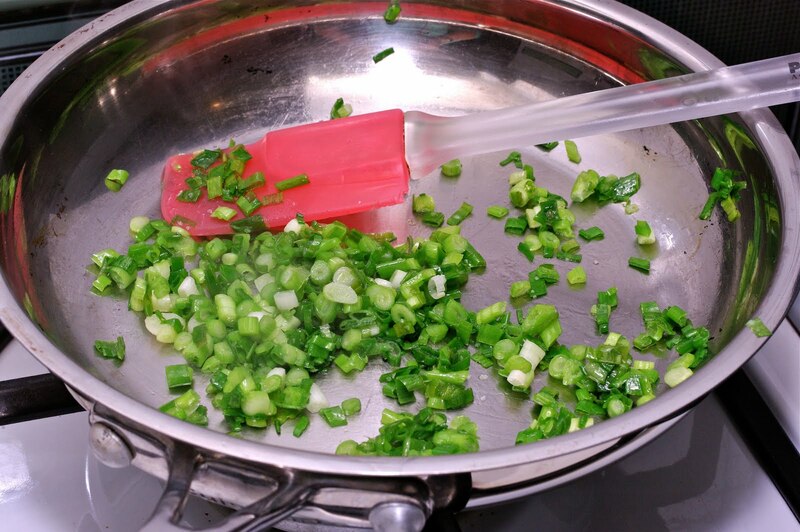 DO NOT to use too much oil when frying or adding to the rice mixture. Too much oil prevent rice to stick together. Add some Korean chili bean paste on top and wrap it with lettuce. You need to put the whole thing in your mouth. No biting off allowed. That’s Korean way! Make them into tennis ball size and tell them the Korean rice ball manner! 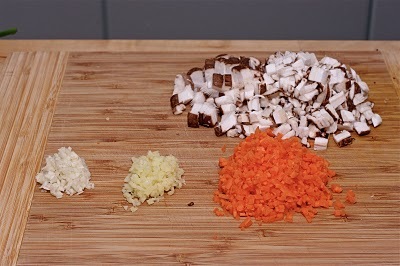 For the rice ball #1: Saute carrots, garlic and ginger in oil over medium heat until soft, adding chicken stock to soften the carrot. 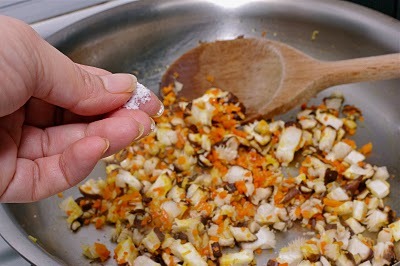 Add mushroom and continue to saute until they are soft. Season with salt, pepper, sesame seeds, and sesame oil. 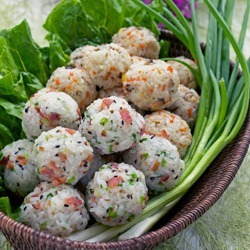 Mix with rice in a bowl and shape them into balls about the size of golf ball. 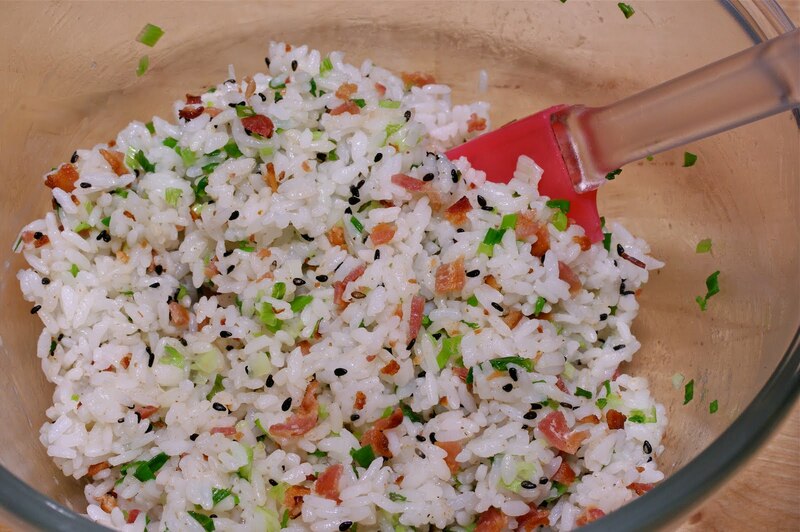 For the rice balls #2: Fry the bacon and chop into small chunks. Saute the green onion with a tiny bit of bacon grease until they are slightly wilted, about 5 seconds. 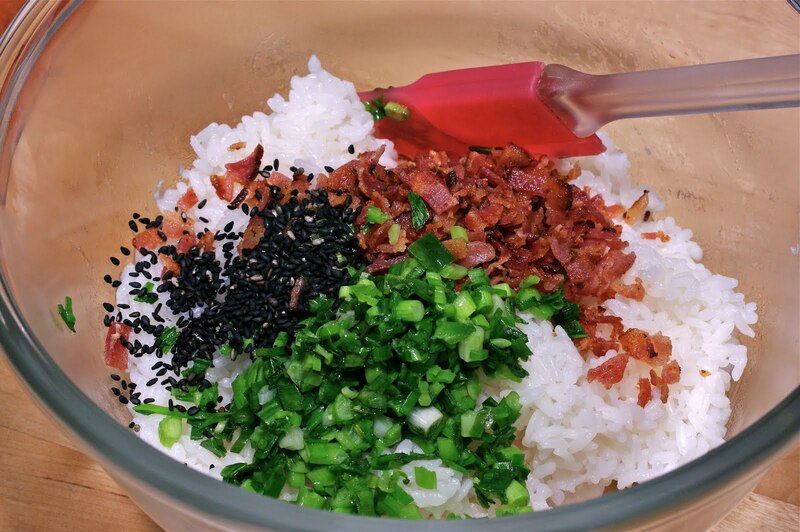 In a mixing bowl combine bacon, green onions, and rice. Season with salt, pepper, sesame seeds, and sesame oil. Shape them into small balls. Serve in the room temperature. 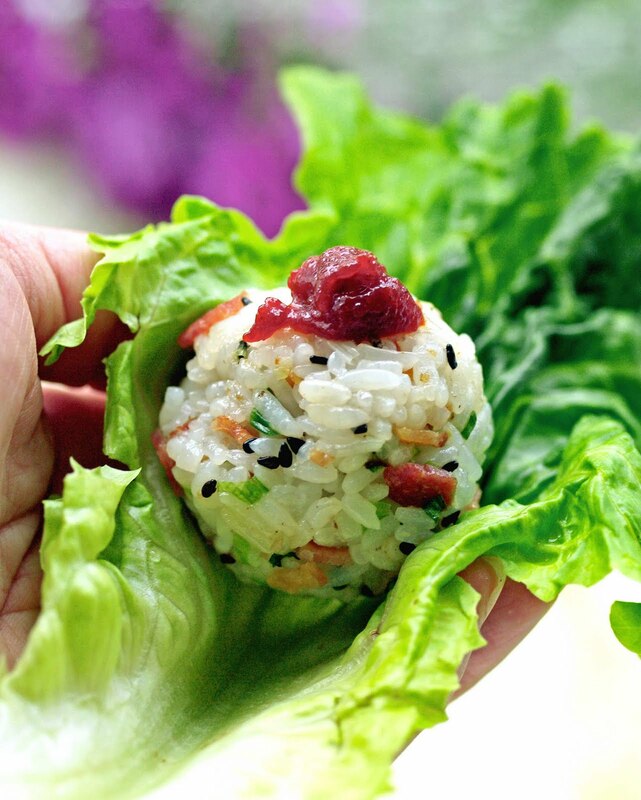 Tip: Serve with Korean chili bean paste and lettuce if you wish. Cover the balls with slightly damp towel to keep them from drying out. This reminds me of Japanese onigiri. My kids love them in their lunches:) I love your blog and as a Korean, I am always looking for Korean recipes to satiate my cravings. I'm following you now! 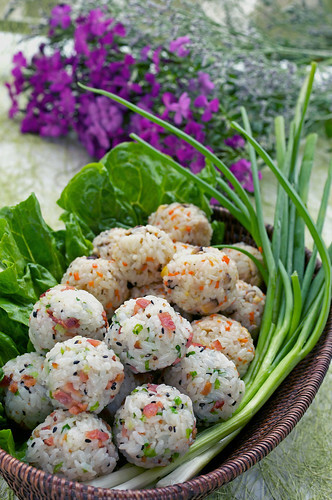 These rice balls sounds so delicious! Thanks for all your kind words. I just a newbie in blogging and enjoy sharing things I love with people. It is very rewarding to get connected with people whom I never met. Have a great day or evening wherever you are. Thanks. My name is Connie Anderson I was browsing internet and found your blog. The author did a great job. I will subscribe to your RSS feeds. Thank you for your contribution. I am a web designer myself. And here some examples of the websites that I designed for canadian payday loans online payday loans company. These look great, I'm excited to try them.. I am living in Egypt and the local rice here is shortgrain, kind of like risotto rice, so I think it should work? 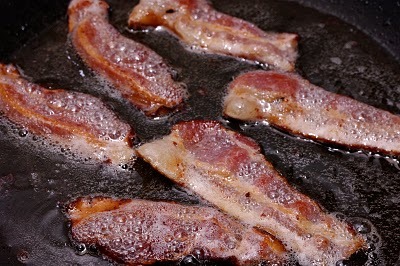 Also, I will not use bacon as it's quite hard to come by here... maybe impossible. I lived in Korea for one year and I miss some of the food, I would love to see a bibimbap recipe on here sometime!! Yes, you can use your local rice, as long as it is sticky. I love bibimbap, too and definitely plannig to post on my blog sometime soon. Have fun in Egypt. Love to visit there someday. Just made the carrot & shitake mushroom rice balls. They are yummy. I have a batch waiting for my son for his after-school snack. Just thought you'd like to know that the cooking instruction for the chopped mushrooms is missing when I chose the Printable Recipe option. Thanks for the recipe -- I've been wondering about making onigiri but have been afraid to but your post made me try it! 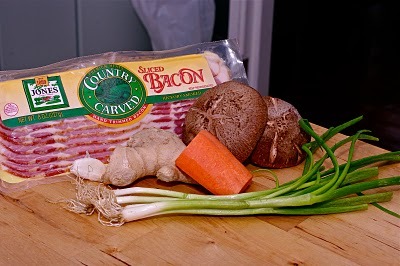 Hi Thanks for visiting my blog and point out the missing part of the method in the recipe. I fixed it. I am glad that you enjoyed the rice balls. Have a great day! I prepared this rice balls and the chicken tofu with my Korean French friend and we loved: we invited French from Mayenne(France) and they were so enjoyed!!! Continue to post your cultural and culinary passion! I have read this post before and of course, like them just as much as any others of yours. But I forgot about the part when you say to eat it all in one big bite- the Korean way- that always makes me chuckle. It really is the Korean way, and how I was taught, too. :] Your recipes and your writing always make me remember so many good things. Thanks again and again. you are very creative! It's great idea. You don't fry or bake the rice balls??? 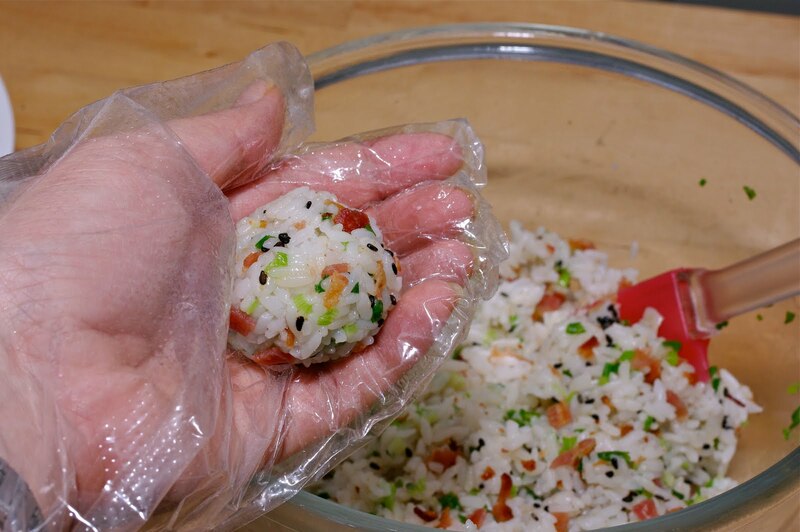 Not for this types of Asian rice balls. Of course you can fry them if you want, but it is good as it is. Thank you so much for this simple and delicious recipe. 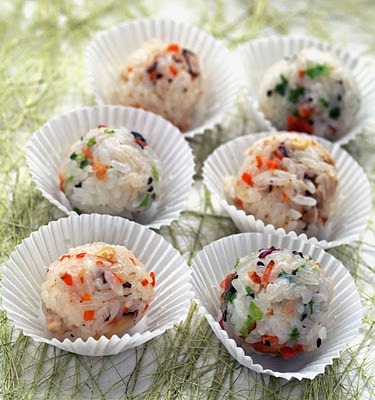 The ingredients in "rice balls" are very flexible, so I will try some other flavors. Here is my rice balls. If you have time, pls spend a moment of time viewing it :) http://www.flickr.com/photos/senorita-libra/8611653019/in/photostream Have a nice day! 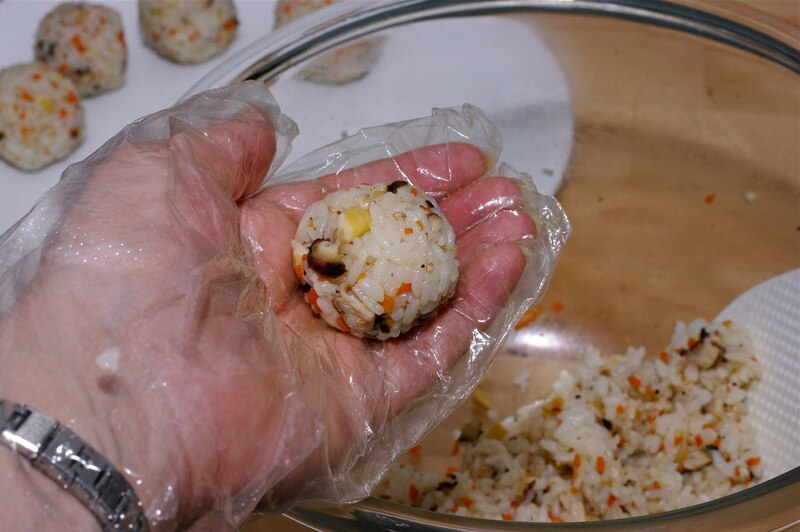 i loveee your idea with this rice ball, i'm facing the same problem with leftover rice, now i know what to do with them..and you are so funny :)) keep up the good job. Yes, you can use other types of meat. Ham or ground beef would be great! We are rice farmers in Northern California. I loved what you posted about each grain of rice. I will share this with my hubby. We raise medium grain that is for sushi. It should work great for this dish. I think my kids will love them, and if I pulverize the mushrooms enough, they will never even know they are in there. Lol. They only don't like them when they see them. I can't wait to try some of your recipes. Your other posts that mention rice cakes have intrigued me. I've never seen those and now want to hunt them down. Do you know how to make them from scratch? I love your blog and have it pinned to visit again. Have a great day, and thank you for sharing your yummy recipes! Hi Becky It is so nice to hear from a rice farmer. 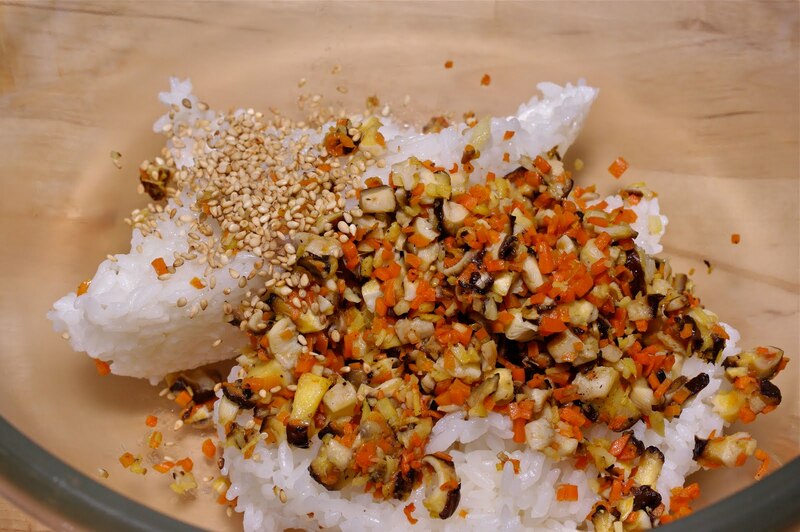 Medium grain will work good on sushi and other rice dishes where the stickiness of rice is necessary. I understand about hiding a certain type of vegetables in a dish. My daughter hated mushroom when she was much younger and I always have to sneak in a disguised form to feed her. ha ha! Hope you can try some of my recipes. Rie cake is not actually hard to make at all, but you will need the rice flour. All you need is the rice flour, a little salt and water (just enough to moisten together). Mix, knead, and roll into long lope, about 1/2"-1" in diameter. Steam or microwave (covered with wet cloth) until fully cooked. That's all! Hope this helps! Should the rice be warm?? Warm rice works better but room temperature will work, too. I would say 2-4 depends on what type of meal you will serve as. As for a quick snack, it can serve 4. As for a simple meal, perhaps 2?